The man who attacked the US embassy in Montenegro on Wednesday was a Yugoslav army veteran, police say. 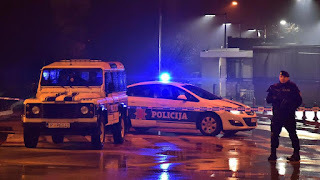 The assailant threw a grenade into the compound in the capital Podgorica at about midnight (23:00 GMT), before killing himself. Authorities identified the attacker by his initials, DJ, but did not name him. Police say the man had no previous criminal convictions, and they still have not found a motive. No-one else was injured in the attack. The authorities are investigating whether more people were involved. The BBC's Guy Delauney in Belgrade says local media have identified DJ as a resident of Podgorica but originally a Serbian national, who served in the Yugoslav army in the 1990s. The man's social media posts include a photo of a medal, a certificate of commendation signed by Yugoslavia's notorious former president, Slobodan Milosevic, and posts stating his opposition to Montenegro's accession to Nato membership last year. Many Montenegrins resent the alliance bombing their country and Serbia in 1999 in a bid to end the killing of ethnic Albanians in Kosovo. Montenegro became Nato's 29th member in June 2017. The man's military past could explain why he had a grenade, which was identified as a Yugoslav-era weapon. The US embassy said all staff were safe following the incident. The embassy and surrounding streets remained closed on Thursday. But people working nearby say the police presence is small and the overall atmosphere in the city is calm. Montenegro, home to about 630,000 people, became independent in 2006 - one of several new countries formed after the dissolution of the former Yugoslavia. However, the country has faced recent instability. In 2016, anger over the attempts to join Nato, coupled with opposition claims of corruption against the then-prime minister, sparked mass protests ahead of a general election. On the day of the election itself, the government arrested a group of men for allegedly plotting to murder former Prime Minister Milo Djukanovic and to launch a coup to prevent the Nato membership bid. Montenegro has charged 14 men for the coup attempt. Two Russians among them remain at large. Russia has denied any involvement in the incident. The country vocally opposed Montenegro's Nato membership. The West and Russia are vying for influence in the Balkans, and earlier this month the EU released plans to extend membership to Balkan countries in the near future. Disclaimer: Opinions expressed in comments are those of the comment writers alone and does not surface or represent the views of Thomasloaded.